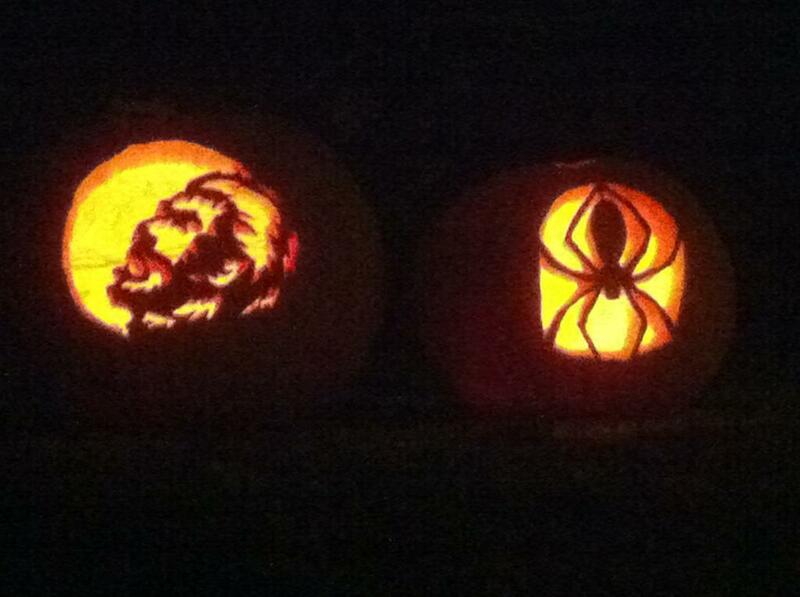 Here’s an awesome pumpkin carving! This was made by Holley and Steven Dover in the Indian Lake Subdivision in Northport. If you have any Halloween Pictures or fall weather pictures, send them to us. Send to weather@wvuatv.com. 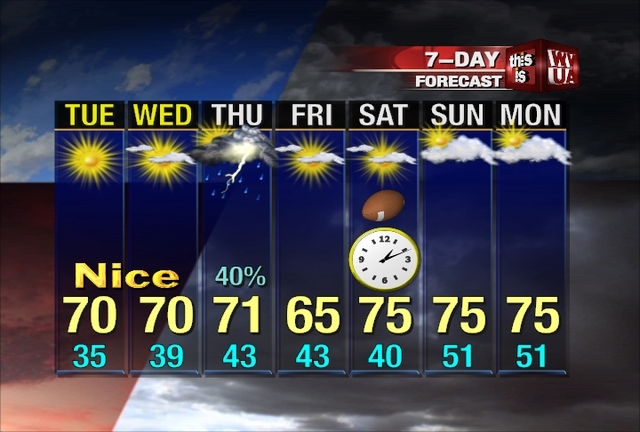 Be sure to join me on WVUA-TV news at 4, 5, 6 and 10pm weekdays for the latest on your forecast. Also, look us up on facebook and twitter by searching weather@wvuatv.com. You can like us on facebook by searching our new page WVUA-TV Weather. Also, send us your weather pictures by e-mail to weather@wvuatv.com. Have a great day! Happy Halloween! Our forecast will include some chilly conditions tonight for all outdoor activities. 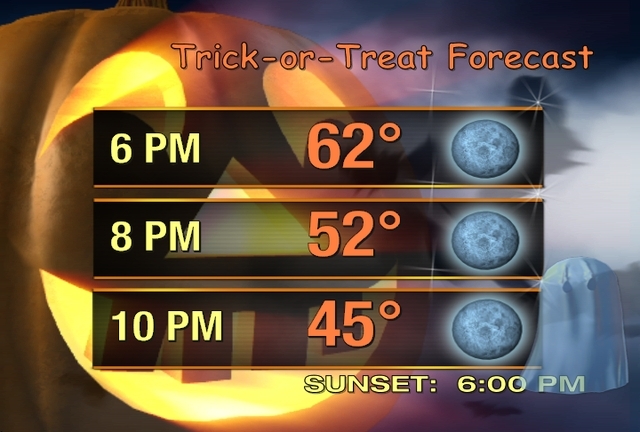 Be sure to scroll down for the Trick-or-Treat forecast. If you are heading out tonight, you may need a thick jacket. With dry air in place, we’ll continue to have these large temperatures swings between the lows and highs. 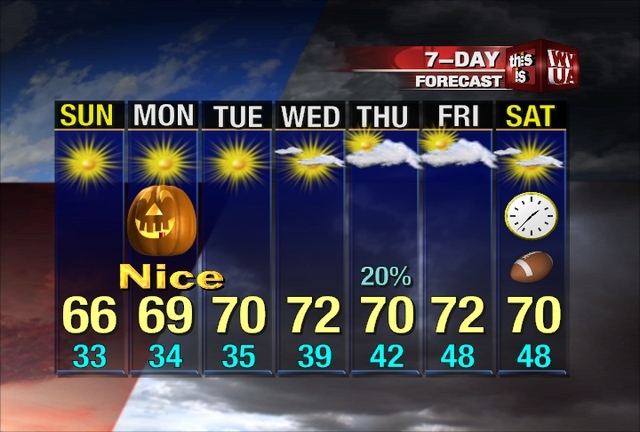 An area of high pressure has settled right over central Alabama this afternoon. Sinking air associated with high pressure is giving us bright sunny skies. After many of us reached the lower 70s, we’ll fall into the middle 30s tonight. I wouldn’t be surprised if some spots reach freezing. A light frost will occur again across much of central Alabama tonight. Tuesday and Wednesday will continue to feature sunny skies and nice conditions; cold at night and warm during the day. 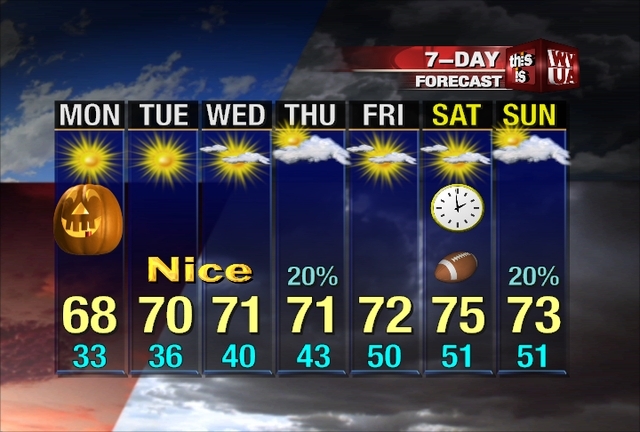 Highs will remain near 70 degrees through Thursday. A weakening storm system will move into the area on Thursday. Showers and a few thunderstorms will develop ahead of a cold front. The best coverage of rain on Thursday will happen north of Tuscaloosa on Thursday. It will get a little cooler behind the front on Friday, with middle 60s for highs, but a quick warm-up will happen in time for the weekend. Big weekend ahead for football fans! Saturday and Sunday’s forecast is very important for a lot of people because of so many outdoor activities happening this weekend. Sports experts are calling Saturday the game of the century, when Alabama plays LSU in Tuscaloosa. We’ll have lots of sun both days, as we’ll be under the influence of high pressure. Cool nights and warm days can be expected. We may reach 75 degrees on Saturday, with a sunny sky. Temperatures will start at 40 degrees around sunrise, and then warm to 68 by lunch and 75 by 3pm. Kickoff in Bryant Denny Stadium is at 7pm. We’ll likely experience temperatures in upper 60s at kickoff, with lower 60s at the end of the game under a clear sky. At this point, there is no risk of rain. Happy Halloween! Our forecast tonight will call for a clear and dry night. Temperatures are in the lower 70s this afternoon, but look for a quick drop in temperatures just after sunset. In-fact, we’ll be in the lower 60s by 6pm and lower 50s by 8pm. If you are heading outdoors tonight, dress warm. It will be downright cold by 10pm, as temperaturse fall into the middle 40s. Extended Forecast update coming in the next hour. Sunday Evening Forecast Discussion – 10 p.m.
An upper level trough along with a surface cold front will begin to approach Central Alabama later tonight. This will bring another re-enforcing shot of cold and dry air into the area. This time around temperatures will not be nearly as cold and will mostly stay above freezing. Never the less, we could still see patchy frost over the next two nights. Once this trough moves through computer models are hinting at an upper level high pressure establishing over the Gulf of Mexico and remaining in place quite possibly through next weekend. This pattern will favor warmer temperatures over the region along with little rain chances as it tends to keep troughs and waves to our north. Both the GFS and Euro models continue to bring an upper level system late Thursday night into Friday. The GFS keeps the system a little farther north than the euro as it shows a stronger high pressure over the gulf. Either way, moisture will be lacking and thus rain chances with this system do not look too spectacular. Looking into next weekend, both GFS and Euro strengthen the ridge aloft across much of the southeastern states. This will basically block any upper level system from moving across the Southeast with the end result being warmer temperatures and continued dry conditions. The pattern could even extend out to the following week and both models suggest it. Saturday Evening Forecast Discussion – 8:45 p.m. There is a Freeze Warning for much of Alabama tonight. The most likely areas to see any widespread freezing temperatures will be across the northern half of the state. With winds already beginning to drop off and dewpoints currently in the upper 20s and low 30s it is likely some areas will see a freeze with frost across most of the area in the morning. There may be a few isolated locations in the frost advisory that will edge close to 32 degrees by sunrise, but confidence is highest that they will stay above freezing. A strong upper level trough will help push the surface high pressure quickly out of the area on Sunday. An increase in cloud cover during the overnight hours will help keep temperatures in check and not nearly as cold. Precipitation is not expected with this system due to a lack of low level moisture. High pressure settles back in on Tuesday and will remain in place at least Thursday. Long range models continue to struggle with the long term portion of the forecast. Both GFS and Euro show another upper level system approaching the area on Friday. The Euro is the more progressive of the two as it moves the system through just in time for high pressure to settle back in for next weekend. The GFS is much slower in its solution as it moves the system through during the weekend. As a result of this change, MexMOS model is now coming up much warmer for the latter half of the week. Given how much the models have struggled we decided not to go nearly as warm and undercut the guidance by several degrees. 20 Years ago today, the Perfect Storm was born. Not the movie but the real thing… Below is some info on this historic event. 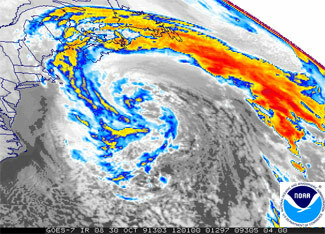 The 1991 Perfect Storm, also known as the Halloween Nor’easter of 1991, was a nor’easter that absorbed Hurricane Grace and ultimately evolved into a small hurricane late in its life cycle. The initial area of low pressure developed off Atlantic Canada on October 28. Forced southward by a ridge to its north, it reached its peak intensity as a large and powerful cyclone. The storm lashed the East Coast of the United States with high waves and coastal flooding, before turning to the southwest and weakening. Moving over warmer waters, the system transitioned into a subtropical cyclone before becoming a tropical storm. It executed a loop off the Mid-Atlantic states and turned toward the northeast. On November 1 the system evolved into a full-fledged hurricane with peak winds of 75 mph, although the National Hurricane Center left it unnamed to avoid confusion amid media interest in the predecessor extratropical storm. It later received the name “the Perfect Storm” after a conversation between Boston National Weather Service forecaster Robert Case and author Sebastian Junger. The system was the fourth hurricane and final tropical cyclone in the 1991 Atlantic hurricane season. The tropical system weakened, striking Nova Scotia as a tropical storm before dissipating. Damage from the Perfect Storm totaled over $200 million and the death toll was thirteen. Most of the damage occurred while the storm was extratropical, after waves up to 30 ft struck the coastline from Canada to Florida and southeastward to Puerto Rico. In Massachusetts, where damage was heaviest, over 100 homes were destroyed or severely damaged. To the north, more than 100 homes were affected in Maine, including the vacation home of then-President George H. W. Bush. More than 38,000 people were left without power, and along the coast high waves inundated roads and buildings. In portions of New England, damage was worse than Hurricane Bob had caused two months prior. Aside from tidal flooding along rivers, the storm’s effects were primarily concentrated along the coast. A buoy off the coast of Nova Scotia reported a wave height of 100.7 ft, the highest ever recorded in the province’s offshore waters. In the middle of the storm, the Andrea Gail sank, killing its crew of six and inspiring the book, and later movie, The Perfect Storm. Off the shore of New York’s Long Island, an Air National Guard helicopter ran out of fuel and crashed; four members of its crew were rescued, and one was killed. Two people died after their boat sank off Staten Island. High waves swept people to their deaths in Rhode Island and Puerto Rico, and another person was blown off a bridge to his death. The tropical cyclone that formed late in the storm’s duration caused little impact, limited to power outages and slick roads; one person was killed in Newfoundland from a traffic accident related to the storm. Have you seen the bright object in the sky each night, looking east after sunset? That bright object is Jupiter. 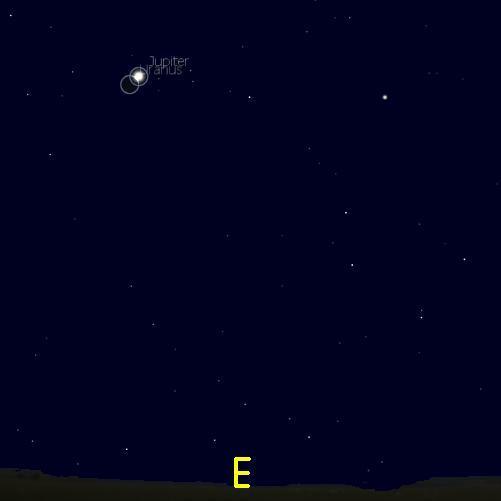 Tonight Jupiter is at opposition, opposite the sun as seen from Earth. This means the giant planet will be up all night, rising in the east at sunset and soaring overhead at midnight. Jupiter at opposition shines ~36 times brighter than a 1st magnitude star, so it’s easy to find. Get out your telescope for an unusually good view of the planet’s belts, storms, and moons. Clouds will hold thick tonight, but Jupiter will still be in opposition to the sun through the weekend. You’ll have a great view of the planet each night.